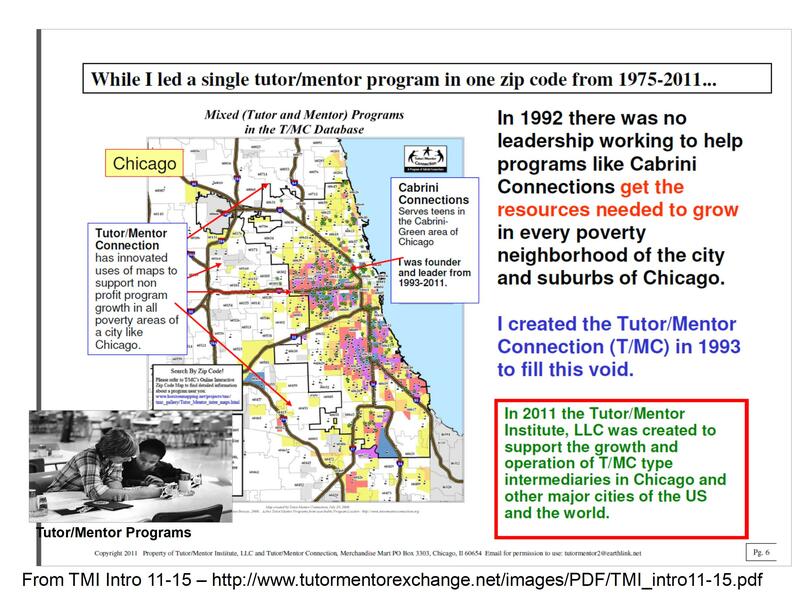 The Tutor/Mentor Connection idea originated between 1975 and 1992 as Dan Bassill led the Montgomery-Ward Cabrini Green Tutoring Program in Chicago, which grew from 100 pairs of 2nd-6th grade youth and workplace volunteers to 300 pairs by 1990, and to more than 400 pairs by June 1992 after the program re-organized as a non profit in mid 1990, with the name of Cabrini-Green Tutoring Program, Inc. (this timeline shows this growth) During those years he also held full time advertising management roles at the Montgomery Ward Corporation headquarters in Chicago. One of the secrets of the program's growth is that Dan began reaching out to leaders of other youth programs in 1976 to gather and share ideas. This continued through 1992. In late 1992 Dan and six other volunteers created Cabrini Connections, a tutor/mentor program serving 7th to 12th grade inner city teens. At the same time they decided to try to fill a leadership void, and created the Tutor/Mentor Connection to help volunteer-based tutor/mentor programs throughout the city get the resources needed to grow. Since July 2011 Dan Bassill has been continuing to lead this strategy under a Tutor/Mentor Institute, LLC structure. While the tax status and resources to do this work is different, the goals have not changed. This work still depends on donations. Can you help fund this work? Click here to read more. The strategy of the T/MC is blueprinted in this Strategy Concept Map. View library of concept maps. View articles showing use of concept maps. This entire web site are the "strategy in action". The ideas can be used by anyone, in any city with high concentrations of poverty. * This is one of the 1999 Tutor/Mentor Report newsletters sent to more than 8,000 people in Chicago and around the country three times a year. See additional newsletters from pre 2000 in this newsletter archive section. See media and awards resulting from actions of Tutor/Mentor Connection. 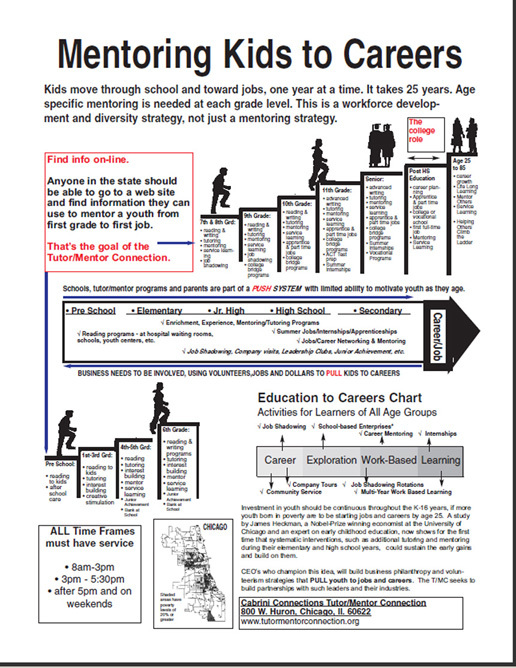 This page shows people and organizations who helped the Tutor/Mentor Connection grow in the 1990s. * This is a "How to Start a Tutor/Mentor Connection" paper distributed at a National Conference in 1999. This is one of many "idea essays" in the Tutor/Mentor Institute, library. * The ideas Dan Bassill shares via the Tutor/Mentor Institute, LLC and Tutor/Mentor Connection were developed over 36 years ( 1975-2011) of leading a volunteer-based tu tor/mentor program in Chicago as well as 17 years in retail advertising, 3 years in US Army Intelligence, 3 years working as a Loaned Executive with the United Way/Crusade of Mercy and 4 years studying history at Illinois Wesleyan University (who awarded Dan an honorary PhD in 2001). * Connect with Dan on Twitter, Facebook, LinkedIN and other social media. Visit this page for links. Dan is available to share the ideas presented in this web site via workshops or one-on-one consulting. This fee structure is a suggested range of fees for such idea-sharing. If you would like to offer help please email tutormentor2 at earthlink dot net. Stay informed! Sign up to receive our eMail newsletter and alerts.